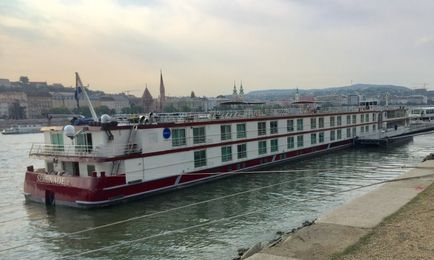 15TH TRIP CRUISE ON THE DANUBE. CRUISE ON RIVER DANUBE TITLED "The Danube's Great Cities"
We took this cruise in Mid August with Shearings to celebrate our Diamond Wedding Anniversary. Leaving from Cambridge Services and travelling by Coach to their Interchange near to the Tunnel. Here we boarded another Coach with Husband and Wife Team who took turns in driving to the Tunnel and through France and into Belgium stopping every couple of hours for Comfort Break at Services. Hot and Cold Drinks were served on the Coach too. The Ship was luxurious and immaculate. The Crew were all very friendly and couldn't do enough for you. Our Cabin had a floor to ceiling wall to wall sliding window with a Juliet Balcony. Bathroom had a Bath, separate Shower, Wash Bin and Electric Loo. Large Wardrobe and a Bar/Fridge and Safe. MELK Thhis was our first stop on the first day. A very nice little town and an easy walk from the boat. We did not venture up to the Monastery as OH could not walk up there but had a wander around the town which is verty old and as usual immaculate like all of Austria. We caught a mini bus back to the Ship. The Bus yjat goes back and forth to the Ships. After overnight Cruise we arrived in my favourite city Vienna. Our coach had travelled down from Passau and picked us up to do tour of the City with a guide on board. We and another couple, who had never been here before decided to tour city on our own when we were dropped off in the centre. We made our way, as we usually do to the Sacher Hotel to partake of a a huge piece Sacher Torte and Cafe no calories of course. 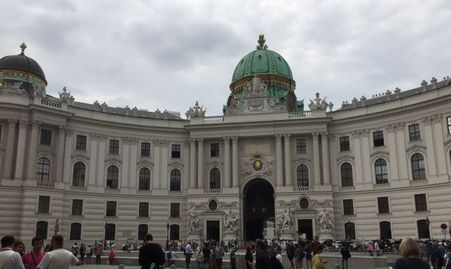 We walked down the Stephansplatz past St. Stephens's Cathedral, looking in the wonderful shops, on our was to Josefsplatz and the Hofburg, winter Palace of the Hapsburg dynasty. Lovely mode of travel in the City. The Hofburg Palace. On a previous visit to Vienna we did a wonderful tour of the Winter Palace will woth a visit..
We then took a Taxi back to the Ship.€10. for late Lunch. After Lunch sunbathed on top Deck During Dinner left Vienna for Budapest. We found on our bed one morning an invitation to join the Captain for Cocktails to celebrate our Anniversary. There were 3 other couple too celebrating special occasions. Waking up at 6 am this was the scene from our bed of Pest on other side of the Danube. This is the Elisabeth Bridge from Buda to Pest taken from our Cabin window. After tour of Buda the coach crossed the Bridge to where he parked and we had a nice walk around till a sharp storm sent us back to the coach.. In the afternoon we took a walk into the City and on return to Ship saw this colourful Bus parked at side of the road. 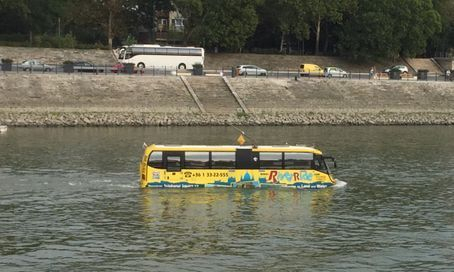 On leaving the mooring on way to Bratislava that evening we saw the bus again sailing up the river which caused a laugh. When we arrived te next day at Bratislava this was our mode of transport for sightseeing in the City. This is the restored Baroque Castle that stands on the Hilltop. 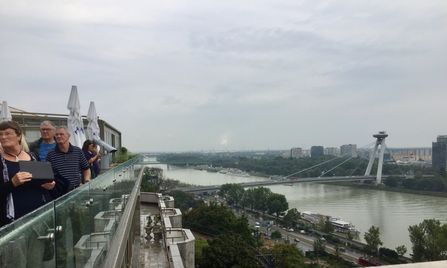 View over the River Danube and bridge. You can see the UFO Observation Deck at the end of the bridge unfortunately it was closed so could not visit as booked. We were moored just the other side of the Bridge. On arriving back to the Ship we sailed overnight to Durnstein back in Austria. Durnstein. The Blue and White Church stands out hen sailing on the Danube. 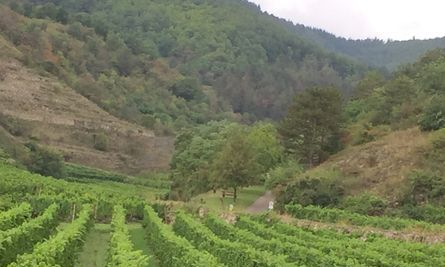 This is a pretty little olde worlde wine town and worth a visit. 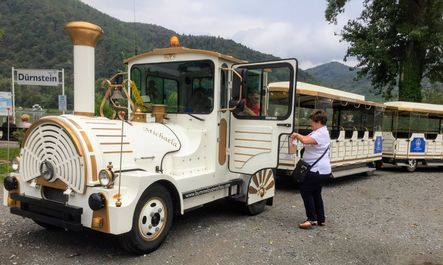 Another little train to take us on tour around the village and through the vines. Pretty Gastoff through the Archway. 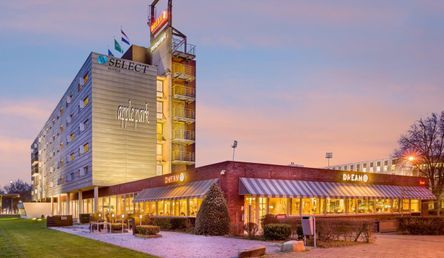 After another overnight Voyage from Durnstein we awoke moored up in Linz with our Coach waiting to whisk us on another two day journey home staying at this Hotel overnight at Maastricht. It was a wonderful 10 day Trip and one we will always have happy memories of. 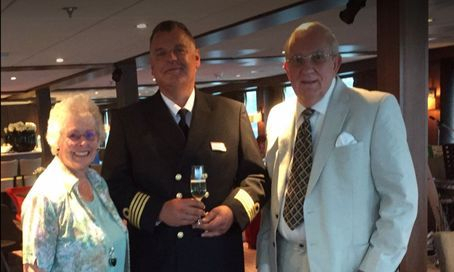 The ship wasn't too large just 125 Passengers and we met 2 other couples on the coach and had a Table in the Dining Room together.